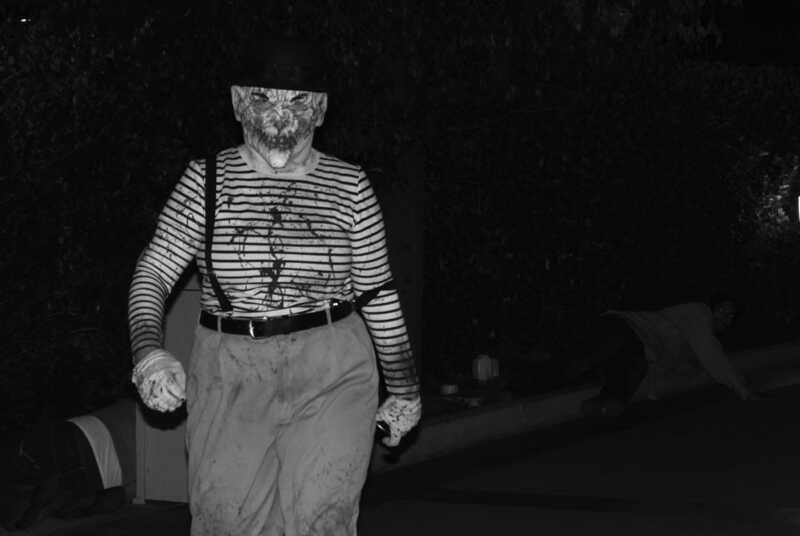 One of the Universal Studio's talent, who patrolled the entrance of the attraction "Terror Tram." It is that time of the year where Universal Studios re-opens its horror themed “after hours” event; Halloween Horror Nights. This September marks the 17th year the event has taken place at Universal Studios, Hollywood. This year the featured mazes are “The Exorcist,” “American Horror Story,” “Freddy vs. Jason,” “Texas Chainsaw Massacre,” “Halloween,” and “Krampus.” Each maze is enhanced with particular types of music, sound effects, smells and props that compliments each theme. Besides these attractions there is the Terror tram where director Eli Roth shares the visual experience of a serial killer clown known as “Hollywood Harry.” They also have an area that is “The Walking Dead” themed, which holds a maze that has participants walk through and experience different scenes from the show. The park also has “scare zones” that are outfitted to resemble the movie franchise “The Purge,” where different areas are set up with said theme-inspired sounds and decorations. Professional actors walk around in character, being frightening as possible. Universal is also featuring the nationally famous dance team, “Jabbawockeez,” who will be performing exclusive live shows just for the park. Several news outlets covered the opening night with well known actor Evan Peters (“American Horror Story”/”X-men Franchise”) showing up in front of the “American Horror Story” attraction. Most of the park is available after hours, except for “The Wizarding World of Harry Potter,” “Despicable Me Minion Mayhem” and “Fast and Furious-Supercharged,” which are all closed off and are only available during the day. Alcohol is not sold during the event but all of the regular concessions are available from the open areas of the park. The event nights are available from mid September to early November, with the regular park closing at 5 pm and reopening from 7 pm to 2 am.